Back in 2002, Greg Brady, a supply chain visionary and Ranjit Notani a pioneer in multi-enterprise collaboration technology came to the conclusion that the traditional paradigm of business-to-business collaboration built around enterprise-centric software was fundamentally flawed. Businesses must take an outside-in network view and together serve the end consumer. In May 2003, they acquired Elogex, a cloud-based logistics software company, and founded One Network Enterprises with a vision to create consumer-driven business networks. They developed a network platform that enabled entire business communities to collaborate and work together to serve the consumer. Brady and Notani brought the network way of conducting business just as LinkedIn did so to managing professional contacts. They re-imagined how business software is built, delivered, and used for today’s dynamic and highly inter-connected world. It would be some years later that the business world would come to recognize that the years 2002 through 2004 marked when the pioneers in network platforms, such as Reid Hoffman (LinkedIn 2002), and Mark Zuckerberg (Facebook 2004), would forever change the face of many industries. Since then network platforms have really taken off, and apps like Uber, AirBnB, have demonstrated the immense value to be gained from matching supply to demand and collaborating on a real-time, multi-party network. Today the company leadership is more convinced than ever that only a network approach can solve a network problem. After more than 14 years of research, development and testing, One Network’s patented cloud platform, The Real Time Value Network, is proven to simplify business systems technology, increase speed and agility, and deliver higher service levels at dramatically lower costs. Their vision is born out in the results. Leading companies such as Del Monte, Dana, and the U.S. Marine Corp have simplified their technology, boosted efficiency and service levels. One Network was awarded the Dept of Navy IT award for its solution and work with the Marine Corps. On average, customers on the Real Time Value Network can reduce overall costs by 3-5%, see a 56% increase in inventory turns, and 38% decrease in safety stock (“Real Value of Value Chain Networks,” Nucleus Research, 2017). One Network Enterprises founded by Greg Brady and Ranjit Notani. Official launch of One Network Enterprises at The Bowery in New York City. Rich Karlgaard, publisher of Forbes magazine, first identifies One Network as a disruptor. ONE awarded IT/IM Excellence ward for the Ammunition Automated Information System for work with the US Marines. ONE awarded patents for intelligent permissions framework for multi-party networks. ONE is Motorola Grand Prize Winner as Value Added Distributor. ONE receives Top Gun Award from U.S. Department of Defense. ONE awarded patent for intelligent demand sensing and forecast adjustment. One Network is the subject of pioneering research in Science of Theoretical Minimums in Supply Chain at University of North Texas. ONE launches the world’s first secure nationwide network for pharmaceuticals in Rwanda. First Consumer-Driven Intelligent Network for Restaurants and Food Service. Frost & Sullivan gives “Product Leadership Award” for One Network’s Defense solution. Nucleus Research identifies ONE as a leader in Control Tower solutions. RTVN 18.0 launches with enhanced intelligent agents and industry-specific capabilities. 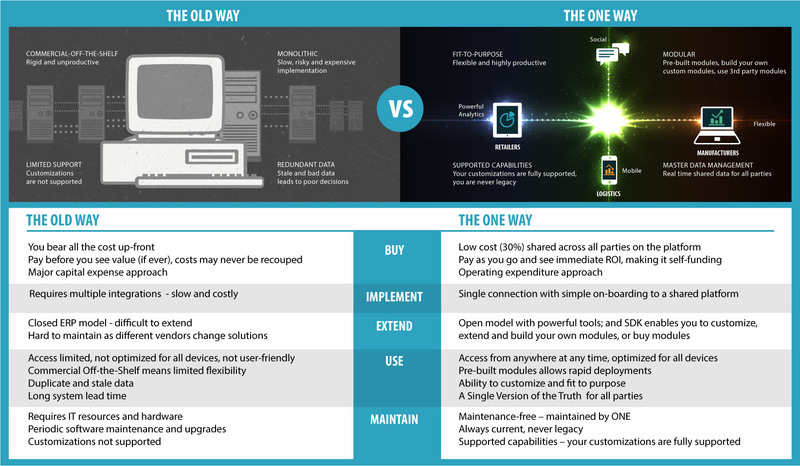 With so many technology solutions available, is One Network really all that different? You will be surprised at how radically different One Network is. But the most important thing is that it means better, faster, cheaper solutions for you.